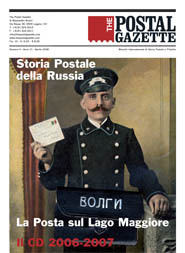 Russia took an immediate interest in the British postal reform. Nevertheless, there was a notable delay before the first postage stamps were issued. The most likely explanation is that the Russian postal administration maintained, for many years, that the system of allowing advance payment of postal charges only with the use of pre-paid envelopes was perfectly adequate. In 1852, however, there were contacts with the postal administration of Prussia (which handled mail exchange between Russia and other Western European States) from which it emerged that it would be worthwhile to allow advanced payment also on correspondence addressed abroad. By Benito Carobene.